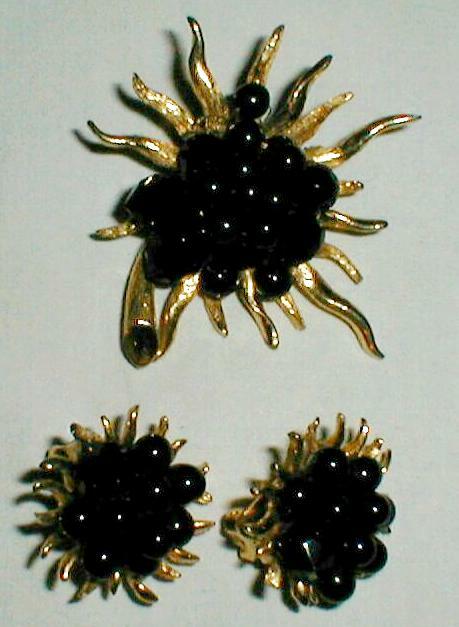 3-D black glass stones in round and faceted shapes rise from thick quality goldplated sunburst style cast. 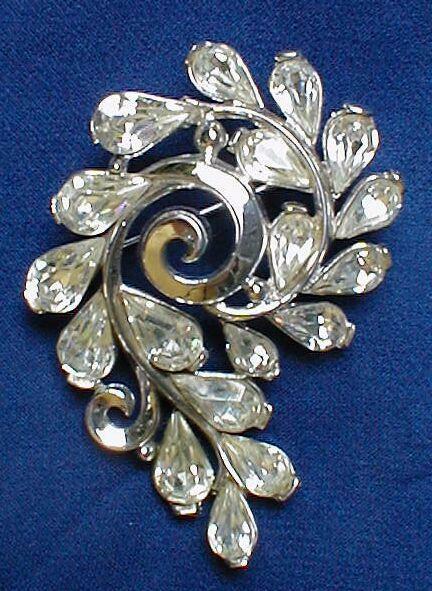 Marked DeMario on oval clip on brooch, and stamped on back of earring clips. 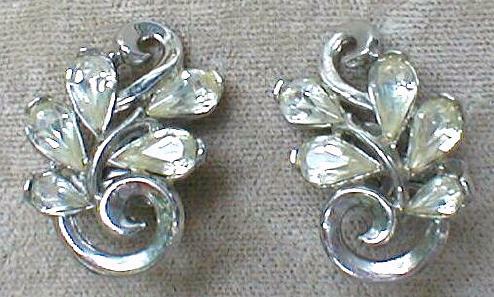 Size: Pin 2 1/2" H x W, earrings 1 1/4", wide comfort clip style. Bright royal blue enamel and rhinestones highlight thick gold cast ram's heads on wide intertwined octangles brooch. Ram's heads top identical size pendant clip earrings. Maker's mark plaque is intentionally obscured, someone's idea of a knockoff but well made. From c:a 1980s. Condition: New. White areas on blue enamel in image are light reflections. Size: Brooch 2 1/2" W x 1 3/4" H, earrings 2 3/4" drop. This dramatic large curved three-dimensional rosette pin is completely prongset in alternating sapphire-blue and emerald-green round glass rhinestones on an open-work black-lacquered cast (called japanned) against a background of aqua rhinestones. Center is a large aqua rhinestone. 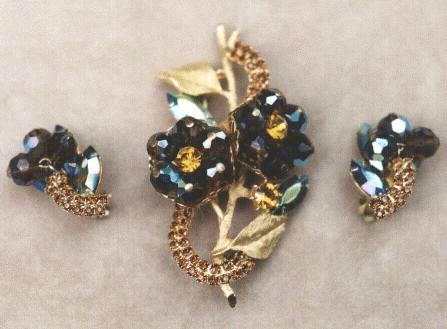 Clip earrings are miniature rosettes. Probably from the early 1950s. 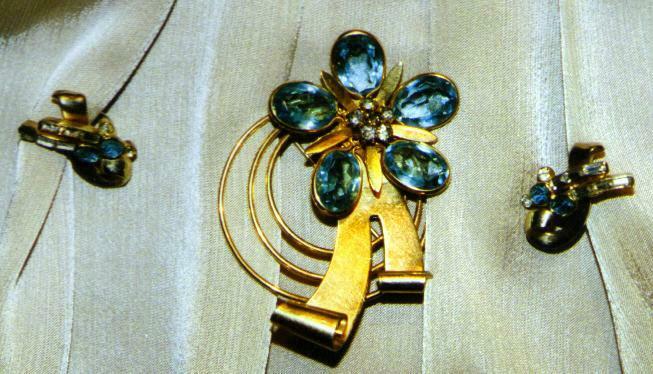 Pin is marked KRAMER, earrings not marked. Sizes: Brooch 2 7/8" dia., Earrings 1 1/8" dia. Three free-hanging glass teardrop faux moonstones in hues of blue and teal are suspended from top bow. Prong-set aurora borealis stones in blue and teal. Clip earrings. Marked AUSTRIA. From the late 1940s. 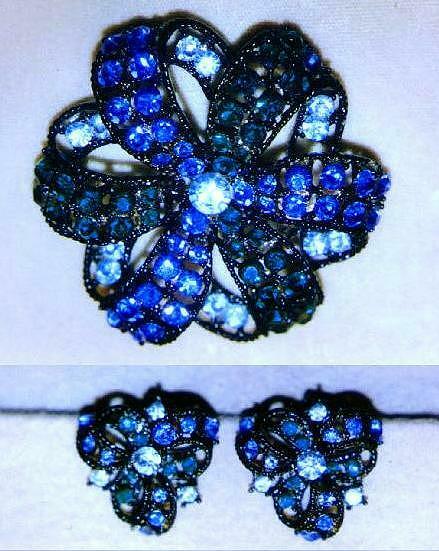 Size: 2 1/2" W + H, earrings 1" approx. Elegant domed swirl with pear-shaped rhinestones is rhodium-plated and clip earrings a perfect match. From late 1950s or early 1960s. Marked TRIFARI and copyright C in a circle. Sizes: Brooch, 2" H x 1 1/4" W approx., Earrings: 1"
Unusual facetted crystal beads in blue-green mounted on cast and hand-assembled combination setting with aurora borealis highlights, topaz color rhinestone streamers, goldplated. Probably from the 1950s. 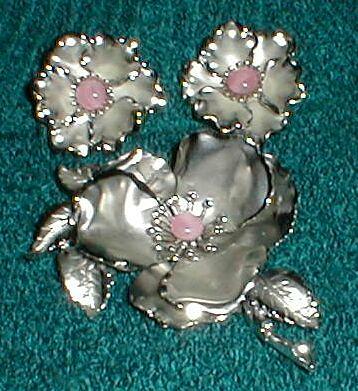 Sizes: Pin 3" x 1 3/4", Earrings, clip, 1"
Big anemone style brooch in 3-D has matte and shiny finish, center faux moonstone in pink glass edged with raised pistils. Wingback pin stem construction, silverplated brass. Matching clip earrings. Both marked Coro. C:a 1960s. Size: Brooch 2 1/4" H x 3" W, earrings 1 1/2" dia. Five non-foiled faceted aquamarine color crystals form the petals bezel-set around smoky topaz gray pronged rhinestone pistils at center. Spray details, ribbon flourishes and open 3-ring background all say vintage Retro. Brooch is marked 1/20 12K, goldfilled. 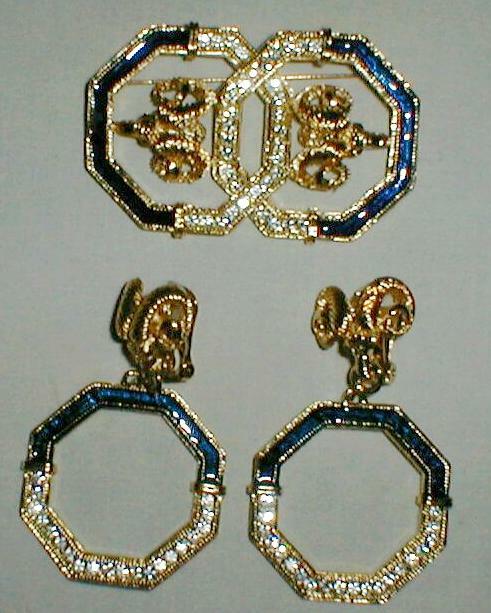 Matching screwback earrings repeat brooch's oval aqua stones motif, golden swirl, accented with baguette rhinestones. 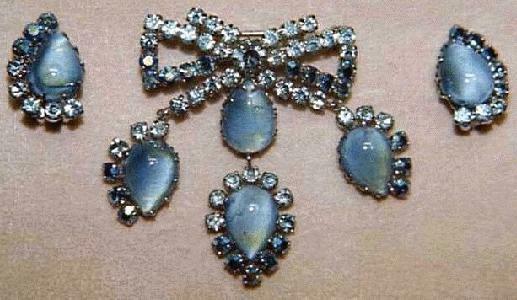 Earrings are marked LISNER, brooch is not. C:a 1940's. Size: Brooch 2 1/2" H x 2" W, earrings 1 1/4"